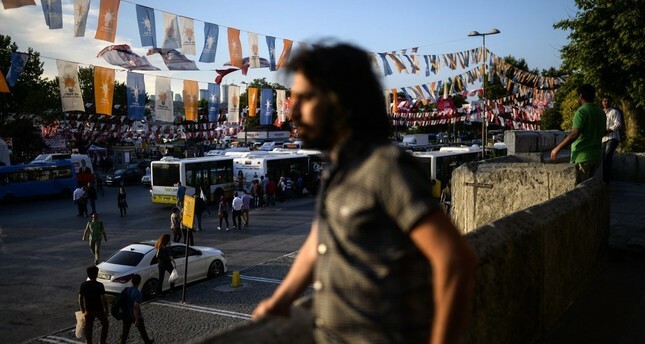 A man stands near an AK Party flag during the campaign period for elections in Istanbul, June 4, 2015. The ruling Justice and Development Party (AK Party) will pay attention to each region's unique characteristics and carve out its campaign for the March 31 local elections accordingly. "We have been using the same rhetoric throughout Turkey. However, we will localize this approach according to each city in the local elections," AK Party Deputy Chairman Mahir Ünal said during a live show on the state-owned TRT channel yesterday. Ünal underscored that each province has different demands, needs, and characteristics and therefore the party will inevitably change its rhetoric to attract more voters coming from different backgrounds. Pointing out that they will pay special focus on the municipalities of different parties by transforming their rhetoric, he added that they want the western İzmir province, which is a stronghold of the Republican People's Party (CHP), to be introduced to the AK Party services and accomplishments in the upcoming elections. The AK Party has been regarded as a center-right mainstream party that has been in power since 2003. The party has also won in most of the provinces in the local elections since 2004, coming to the fore with its success of rejuvenating its party organizations and discourse to appeal to the electorate from across the political spectrum. Stressing that the Kurdish-majority southeastern provinces, which have long suffered from the PKK terrorist organization's attacks, should be addressed by unique and specific campaign rhetoric, Ünal stated that the people of these regions want the current security to be maintained after PKK-ravaged cities were extensively reconstructed by the government. The PKK terrorists embraced a strategy to carry its war against the state from the mountains to the cities in the southeast by exploiting the cease-fire period between 2012 and 2015. After successful counterterrorism operations, the PKK terrorists were ejected from the cities, but most of the cities needed to be reconstructed due to damages during street clashes. In relation to the campaigning process of the party, Ünal announced that the AK Party will begin working in the field on Feb. 1. Ünal said that the party will also send election guidelines including information on how to organize their campaigns, rallies, offices and campaign songs, to all the party organization centers. He reiterated they will continue their eco-friendly and digital campaign. In order to prevent visual pollution, the party will only be allowed to display flags at programs and election coordination centers. AK Party election buses will not tour, except on specified times set beforehand. Instead of using the old methods, the AK Party will use technology and social media more for the election campaign. The party also will hold teleconferences via the internet with the party organization throughout the country. Touching upon the alliance between the AK Party and the Nationalist Movement Party (MHP), Ünal underscored that both parties will carry out their own election campaigns, however, party members will occasionally participate in each other's candidate introduction meetings. The AK Party and the MHP first decided to form the People's Alliance in the June 24 elections. As a result, the alliance won 340 seats in Parliament, 290 by the AK Party and 50 by the MHP, while their presidential candidate, incumbent President Recep Tayyip Erdoğan, also won the election by 52.6 percent of the vote. The MHP on late Monday announced 200 more mayoral candidates including mayoral candidates for four provinces. Uğur Şen was nominated for the Burdur mayoral office, Hakan Pınar was presented as Çanakkale's mayoral candidate, Kenan Şahin became the mayoral candidate for Çorum province and Derya Bulut was designated as the Kırklareli mayoral candidate. The party also disclosed their election motto: "National will for national interest, stability for people." In his written statement on the matter, MHP Deputy Chairman, Edip Semih Yalçın, highlighted that their motto is a reflection of the priorities of the People's Alliance and they will also shape their election campaign according to these priorities. Yalçın underscored that the People's Alliance has been an important cornerstone in the consolidation of the presidential systems, especially in the June 24 elections. He reiterated the alliance's main principle is to ensure national priorities and maintain national security. The deputy chairman added that as a part of the alliance, MHP chairman Devlet Bahçeli on Jan. 27 will visit AK Party's Istanbul candidate and Parliament Speaker Binali Yıldırım. Yalçın also announced on Monday that the MHP will organize a candidate introduction meeting in Ankara on Jan. 24. Both leaders of the party have been putting an emphasis on the alliance's main aim, to preserve national security in the face of internal and foreign threats, and say that they will continue to cooperate even after the local elections for this reason. In line with the alliance, Bahçeli previously announced that the MHP won't nominate mayoral candidates in Turkey's largest cities of Istanbul, Ankara and İzmir, but will instead support candidates of the AK Party.